Why some neighbors are so angry with the church next door. 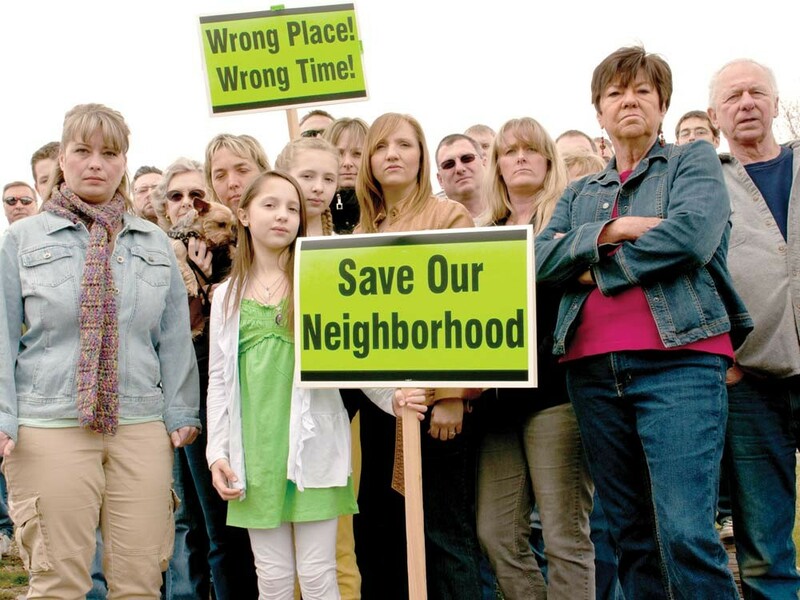 Neighbors who oppose a local church’s plan to build an elderly-housing complex. Stevens is one of dozens of Walnut Road neighbors incensed by a proposed development. But this isn’t about a developer wanting to erect a high rise. It’s about a church that wants to build an affordable-housing complex for elderly people. “This has the potential to destroy the neighborhood,” she adds. Walnut Road is a narrow street that runs through an old neighborhood, north of University City, of small houses and big yards. It had peacefully co-existed with St. John Vianney Church for more than 50 years. But that has changed. In 2009, the church bought a dilapidated property nearby, hoping Catholic Charities would build a 40-unit affordable-housing complex for the elderly. With an aging boomer population, the need for senior housing is skyrocketing, Catholic Charities president Rob McCann says. To build its complex, Catholic Charities needed a “routine” zoning change, McCann says. But when neighbors got zoning-change notifications in the mail, they were caught by surprise. “Nobody had a clue,” Stevens says. A wave of rumors spread across the neighborhood. Worried residents held a petition-signing meeting, where accusations were exchanged: A church member accused the neighbors of breaking the law by stuffing unstamped fliers in mailboxes, and neighbors asked church members to leave. Later, the church held a meeting for both sides, but few anti-development neighbors attended. Because churches usually spring up in residential areas, it’s common for them to clash with neighbors over development. St. Mark’s Lutheran Church and its Manito Park neighbors, for example, have been in a yearlong tussle over a proposed parking lot. Catholic Charities is no stranger to this issue. They’ve needed zoning changes for each of its 15 housing complexes, McCann says. Opposition was typical. But each time, he says, Catholic Charities eventually won over the neighborhood. Some residents living around St. John Vianney support the proposed complex. Others fear it would increase traffic and hurt parking. But McCann says the impact would be minimal. By law, for the next 40 years, the complex can only allow those over 62 as tenants, and only an estimated 30 percent of the elderly tenants would have cars. Other neighbors worry that the complex would fuel crime, decrease real-estate values and add an influx of strangers. When Spokane Valley Planning Commissioner John Carroll looks at the zoning map, the church’s requested change is a no-brainer. The question may be moot. Federal law, Carroll says, will not let a city deny a church a zoning change unless the city has a compelling public interest. Nevertheless, the majority of the commission, including Carroll, recommended that the city deny the church’s zoning request. Some commissioners agreed with the neighbors’ concern about parking and traffic. Carroll didn’t. Instead, he voted against the plan because of the division it has created between neighborhood and church. On one side, Catholic Charities says some neighbors seem to be afraid of poor people and old people. The phone calls weren’t threatening, but Stevens is still worried. “Are they going to be spray-painting my fence?” she asks. “Are they going to break my window?” In retrospect, Marie Raschko-Sokol, chair of the St. John Vianney pastoral council, has regrets. “We should have had a community meeting with the neighbors, with the broader group, to ensure that rumors wouldn’t have occurred,” she says. Carroll agrees, but he says it isn’t too late to get over that animosity. The church could hold more neighborhood meetings. It could bring neighbors of similar Catholic Charities projects across the city to persuade them. It could slowly restore trust.